Probiotics are, by far, one of the most important aspects of a successful Candida treatment plan. Without them, you will not be able to rebuild your immune system or completely reverse your Candida overgrowth. Probiotics serve two main purposes. The first is to replace the good bacteria that your body lost when the natural balance was disrupted and the Candida yeast took over. The second is that the bacteria in a probiotic can suppress Candida and keep it from growing while at the same time balancing the levels of acidity within your immune system. The first thing you want to consider is the bacterial strains found within the probiotic supplement. Some probiotics only have one, but others will have over a dozen. There is a bit of debate in this, but from my experience, I look to see that there are high quality strains of probiotics in there. The strains of probiotics that I look for, although some are somewhat rare because of the high cost are: Bacillus Subtilis, Lactobacillus helvecticus, Saccharomyces boulardii, Lactobacillus acidophilus, Bifidobacterium. Those are just some of my favorite ones, of course there are others that are good, but any good probiotic supplement should try to include as many of those five as possible. You will sometimes see probiotic supplements with 20 strains, but they try to skip the really good ones, and just put in cheap ones. Another thing to look for is shelf stability. Probiotics are supposed to be live and active cultures, so if the probiotics are dead, then how valuable are they really. There are so many probiotics that claim that they have tons of bacteria, but the bottle they come with is more valuable then the contents inside. What I’m saying is you need to choose a probiotic that is actually shelf stable, there are some delivery systems that I prefer such as if they are spore forming. That means that the probiotics are dormant, and are not “alive” so they cannot die until they are exposed to water. Once they are exposed to water by you consuming the probiotics, that is when they become active, so you are ensuring you are taking live probiotics. That is the most stable way of taking probiotics. The delivery system is important as well. Let’s say you get some of the highest quality probiotics, and instead of taking them right away, you put them on the stove, cook them, and then take them. That’s essentially what happens when your stomach acids get ahold of the bacteria. They completely digest it so that you cannot get any benefit out of it. So what can we do? Science has created Enteric coatings, a coating that is made so that it can go through your stomach and to your intestines without it being dissolved. But the enteric coating is very unhealthy, it contains plastic chemicals known as phthalates, which are found in vinyl flooring, shower curtains, cleaning products, insecticides, nail polish, and many other substances. Basically what it shouldn’t be found in is your food, especially health food. Well some companies use a denser vegetable capsule which allows it to survive in the acidic environment of the stomach. It will not last hours or days (did you know that there are some vitamin supplements that go out looking the exact same as it went in? Not even your stomach acids are powerful enough to digest it. ), that is why you are supposed to take the capsule with an empty stomach. It is designed to get through the acidic environment of your stomach safely if you just take it between meals on an empty stomach, and not last too long, but instead dissolve right inside your intestines as it is supposed to. Now, I will tell you what probiotic that I take that meets all of my stringent requirements, but I do suggest you do your own research. Do not follow what I say blindly. 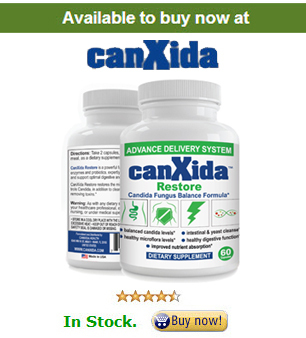 The probiotic that I use is called Canxida Restore. It is by far the best probiotic that I have seen. It contains everything that I have said, and more. There are 8 high quality probiotic strains in each capsule. It uses spore forming bacteria so that it is highly shelf stable. These are probiotics that you can leave out to bake in the sun for months (I still wouldn’t do that), and it will be more effective than one that you buy right off of the store shelf. It is also coated with an extra dense vegetable capsule. Of course there are other things that you might look for within a probiotic as well which I will get into. Prebiotics are different than probiotics, but of course some probiotic supplements advertise themselves as prebiotics & probiotics. There are different types of prebiotics, especially if you have candida, so you have to be careful of what to take. Some are made to feed probiotics, such as Fructooligosacharides, but I wouldn’t use that. I would get prebiotics from food such as asparagus, or Jerusalem artichokes. If I find my body is low on prebiotics, or I wanted to give it a real push, I would use the prebiotic called Isomalto-Oligosaccharide. It will not promote yeast growth like FOS does, but will promote the growth of beneficial bacteria in your intestines. If you do take Canxida Restore probiotics, you do not need a separate prebiotic as it contains Isomalto-Oligosaccharide. It’s difficult to visualize, but the average probiotic capsule contains anywhere from 1bn to 100bn bacteria – that’s billion. A lot of it is marketing, as it’s difficult to fit quality bacteria inside of the capsule. I say aim for at least a billion bacteria, but make sure they are high quality bacteria. Use the list of my favorite five, and try to match as many of them as you can. Now to take probiotics, everyone has different methods. Some ways of taking probiotics are with food, those are usually not coated in anything. Some you take powder (I do not recommend that), and some have a dense coating, or are enteric coated which you take on an empty stomach. It’s best to follow the recommendations of the manufacturer that you buy the probiotics from. As always, check with your doctor if you aren’t sure what type of probiotic to take or how to make the adjustments you need.